Who is it for? Nykaa Serial Kisser Lip Balm Strawberry is a tint-free clear lip balm with awesome strawberry fragrance. This one is perfect for healing dry lips as well as maintaining the moisture balance of the lips. This lip balm comes in standard bullet form. The bullet has an outer pack which mentions main ingredients and a few necessary details regarding the product. The packaging is small so it is easy to carry around. 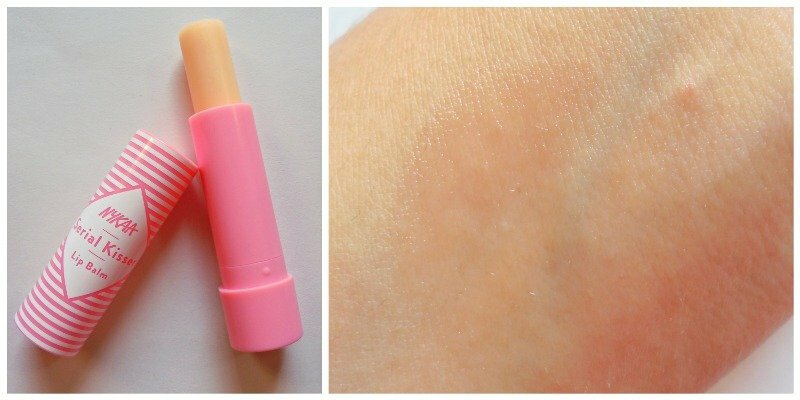 The balm stick has a pale pink color although it does not impart any tint. The texture of the balm is moisturizing and the moisture stays for 3-4 hours without drinks or meals. The thickness of the balm is medium; comparable to Maybelline’s Baby Lips lip balms. It has an awesome strawberry fragrance. The fragrance is moderate to light. So, it would not be bothersome. This one has the best fragrance in the entire Nykaa lip balm collection. Rs.150 is a standard price-point for budget lip balms. For this price, we get to try various brands (Lakme, Maybelline, Jovees, Neutrogena and many more). Quality wise this Nykaa lip balm can easily compete with these popular lip balms. Its consistency is thicker than basic petroleum jelly. It feels light on the lips but keeps the lips moisturizes for a few hours. After that, I need a reapplication. It works well as overnight lip moisturizer if you apply a thick layer of it. I often apply it before putting on liquid lipsticks and it prevents dryness that often results from quick-dry liquid lipstick formulas. This is a pocket-friendly lip balm that takes care of the dryness of my lips plus smells good. So, I am in for another purchase. I would recommend this to someone who is looking for a moisturizing lip balm without any tint.